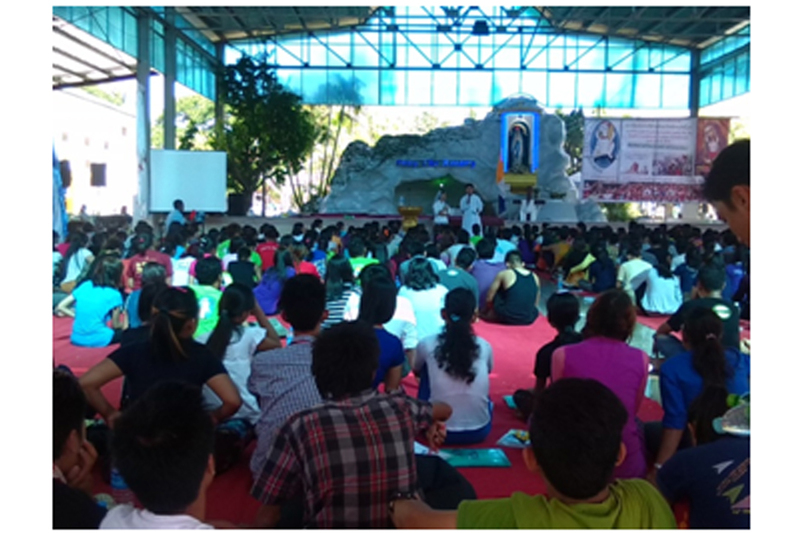 – Archdiocese of Yangon arranged the youth camp in Nyaung Lay Bin Marian Shrine, the famous place for Marian Pilgrims in Myanmar. It was during the time of Water Festival, the pic moment of Myanmar people who joyfully celebrates every year in the month of April. Since it is social festival many young people are attracted to this feast and yet so many people also get injured and lost lives due to the out of control with big crowd and extreme elation. The Catholic church takes initative to animate the camp for the youth and the children as well in order to prevent them to fall in that extreme joy and dangerous celebration. This Year under the Theme of “ Be merciful just as your Heavenly Father is merciful….” there were around six hundred young people actively participated in Nyaung Lay Bin from April 11th to 18th. Our two Sisters Sr. Elizabeth Phyu Phyu Aung and Sr. Agatha Nant Myint Kyi attended to help the animation group. They are impressed by the simplicity and longing desire of the young for their knowing Jesus and loving more to Him. There were interactive moments of sharing and having competition among fifteen groups. 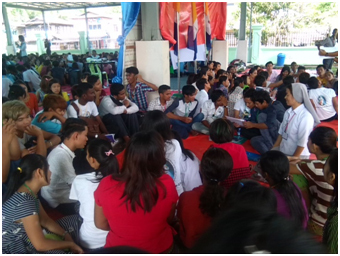 The weather is very hot and the young people are patiently participated the program one after another. The sharing of life experiences, their expectation of joining this camp led them to have a closer relationship among themselves and opening to the voice of God in their prayer moment and receiving the sacrament of reconciliation in this Jubilee Year. They passed the holy door devotedly, guided by the prayer moment prepared by Canosian Sisters, Fr. James Tin Mg Htwe and Fr. Alphonse,SDB. The different congregations also infused in the hearts of young people their charism and invitation to religious life. Sr. Elizabeth Phyu, FMA and Fr. Alphonse, SDB presented Salesian life and Vocation by joint interview program.